Photos from my 2012 Campaign for U.S. Congress. 500 Volunteers. 10 Staff. 4 field offices. 2000 donors. Over $300,000 raised from regular ordinary Idahoans. 110,000 votes in one of the toughest years to run as a Democrat in Idaho. Over 1/4 million phone calls made. Over 25,000 voters contacted and logged. More votes than any Democrat has gotten in the East half of the state ever. With my deepest respect & gratitude: Thank you all. With LOVE & hope that we can & will do better. My staff is phenomenal. We would be nothing but 10 people in a cafe without all of YOU who gave time or money to make this happen. We organized half the state in ways that helped other candidates on November 6th. The work you all did will continue to help many in the years ahead. What will I do next. I don't know. I do know it's not over Idaho. Eight months ago, standing in the statehouse considering whether to run for Congress, I figured I could run a good campaign. What's amazing is that, together with thousands of you, my team ran the best campaign many have ever seen run in Idaho. Stronger, better organized, more tech savvy, more deeply rooted in communities and more issue-focused than I could have imagined. Thirty-five percent of the vote. While that sounds dismal, it still means more than 110,000 voters chose me over Mike Simpson on Tuesday. I think that's ten thousand more votes in the east half of the state than any democrat in any congressional or statewide race has ever gotten. And in spite of how LDS enthusiasm for Mitt Romney made this one of the most difficult possible years to run as a Democrat in Idaho, it appears that our campaign brought in about 25,000 new voters to participate in this election. That's an impressive twenty-five thousand people who did not vote in the 2008 presidential race. We engaged Idaho's powerful Hispanic community and worked so hard that Mike Simpson gained fewer than 2,000 votes from the Romney tide. In fact thousands of LDS men and women and more than 10,000 Republicans and Independents voted for me. That was the work we all did on the phones and the doors --and it mattered. More than anything, you all allowed me to finally have the resources to use TV and direct mail to push back on issues we so rarely get to re-define here in Idaho. I'm proud we exposed the attitudes that have led to Idaho's grim record on fair pay for women and the kind of cowardice that allowed passage of the Luna laws. We also changed the debate on budget cuts by focusing on job loss, and explained who the job creators really are in the economy and why. And last but not least, we've put to rest the question of whether Idahoans will actually vote for a gay person. I feel profoundly grateful to you all. From the unemployed carpenter who gave me four dollars, to the Republican mothers, fathers and working people who've crossed streets and sent email to tell me they voted for me. From the long hours and tremendous heart, hard work and intelligence of my staff and volunteers, to the sense that so many of you gave your time and money because this work is something you believe in. This has been the most amazing experience of my life. We've made history. Idaho needs us all to keep talking to neighbors over picket fences in our communities, volunteering to organize other volunteers, raising money or using phone calls to change minds on the issues we care about -- perhaps to strengthen political organizations and non-profits, to run campaigns or, for many of you, to run for office yourselves. I have no idea what I'm doing next but I love this state. Sadly, Idaho has failed so many families who've faced hardship these past years, those who've lost jobs and homes or small businesses; those who've waited so long for respect and dignity or legal status; those who strive for simple security or the tools for independence; those who struggle to pay for a college degree or just to put a meal on the table. The work is not over. What you all have done is so beautiful. 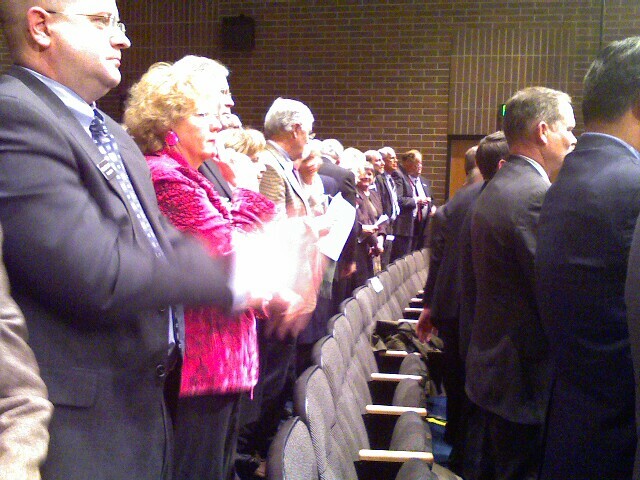 Many of you came to this because you care and believe Idaho and its policy makers can do better. Lives depend on all of us using our skills to motivate friends to challenge our Idaho Congressmen, state lawmakers and local officials when policies become cruel or disrespectful. For the lives and futures of people we care about, let's carry with us what we did this year and make this congressional campaign not an end, but a beginning. In these last days, the boxes come out. Empty stacks of them line the halls like flimsy coffins. Senator McKenzie announced this morning we have tied now with the 10th longest session in our 121 year history. By Friday we will tie with the 5th longest. Yet this one with its gut wrenching policies and passionate, even desperate bipartisan debate, seems to have passed like a blurred dream. --Long evenings pouring over each new version of Tom Luna's long, painful bills to find any change, the implications of each new word or deletion. --Walking in here from dark streets in the snow or rain or cold. People honking, waving, thumbs up. --Streams of email like water, where my email box came alive, filling faster than i could read or move to sort or answer. --The tears of teachers. Many times. Passing words. Me wishing I could say how sorry I am, in my core. And somehow I expected we would do more than just damage, that there would be a limit to the damage we were willing to do. But, with a few brilliant exceptions, we moderates and Democrats lost every major floor debate: protecting schools; trying to stop the bleeding in Medicaid, mental health and disability services; protecting private end of life and medical decisions; opposing the Republican Party's attempts to strip voters bare, branding party affiliation in waterproof marker on every human chest. And here I need to say this --say the Republican Party seems broken, bogged down in divisive social and anti-government issues that have been impairing its ability to deal with our state's failure to recover economically; to grow not destroy jobs; protect services which people's lives depend on; stop policy that is already demoralizing and decimating the most important profession in this state, policy which gives millions away to corporations under the guise of reform. I wish all those moderates out there and in here who have been bashed and bloodied -- those who have had enough of all this would join Democrats, help us re-build the Democratic Party back to something powerful enough to check this freight train that is taking our schools and economy downhill before our eyes. What more does it take? What more has to happen? What more can they do to you? Senator Kate Kelly served as Senate President yesterday. There are only seven democrats in the 35 member Idaho Senate. Senator Kelly is the state's first female Senate Minority leader since Mary Lou Reed in 1994. Kate will be retiring from the legislature this year and so Republican leadership asked her to take the honor of wielding the gavel and running the lot of us through the orders of business and the hugely formal process of running the Senate floor process where we meet as a group to vote on legislation that has come to us from the Senate's ten committees. It was a delight to call her Madame President. Some on the floor stood fro recognition just to do so. She got a standing ovation as she left the diocese. Losing Kate from the Senate means losing the state's most hardworking proponent of ethics reform. It means losing a legal mind with a strong background in environmental issues. It means losing a classmate and friend I have served with for six years, someone I have laughed with, prodded to eat more, talked of family with, respected for her frequent kindness and firm integrity. It means likely that Branden Durst, brilliant, hardworking and on occasion religiously conservative, will run now to come here to serve with us. Kate and Branden could not possibly be more different. Branden brings to us though a sharp eye like Kate's, a voice that cracks and breaks like Kate's, but one that will surely learn (like all of us slowly must) to blend with it the kindness and deference to the proprieties of the Senate. It feels like nothing next year will be the same here, especially without Kate. It never is though. This place is like water, ice, steam -- year to year, day to day, minute to minute. My legislative district is amazing and unusual. I grew up in and lived for many years in Custer County, land of mountains and farms and ranches scratched green in desert along flat spots by rivers. A place of very few people. I understand conservative, agricultural and small government perspectives. But here in the legislature I represent a district containing far more vegetarians than cows or chickens. My district rests beneath the statehouse and surrounds it like a sea of trees and buildings, rivers, cyclists, sage covered foothills, trails. Ours is a place where people often walk to work and grow gardens and I think perhaps understand the Idaho legislature as a hostile occupation of our progressive turf. Today we debated oversight of facilities that raise animals for food and meat. Senator Siddoway debated, saying that the bill made him nervous, even if it was as some said intended to pre-empt attacks by animal rights groups to make the state of Idaho look bad. In the debate here below the red velvet curtains, nothing was said of the animals, the chickens and the cows, so I did stand to debate that the proposed advisory board was skewed, giving barely two votes of ten to speak for the animals and not those whose business is to make money selling their parts to the non-vegetarians of Idaho. I reminded myself that humor is one of the few ways for me to make my way here without constantly being an unwelcome voice of dissent. So I stood and spoke for the chickens and the cows. Someone has to. It is not like anyone seems to have a plan for how the Republican House, Senate and Governor will agree on anything and go home. 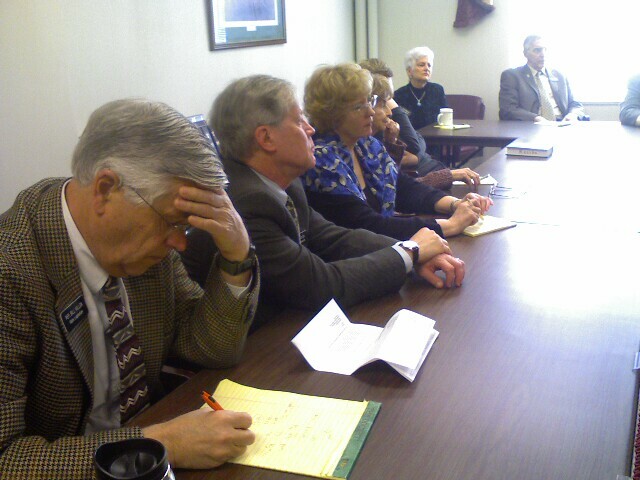 Senate Republican leaders are trying to help Governor Otter save face. So polite. But at what cost? And why take the fall for him pouring himself such an oversized pair of cement booties? The House says it is going home with or without us. I agree, we should go. But Senate Republicans have closer relationships with the cement and engineering industry lobbyists who must be camped in Otters office. They say they wouldn't dare override the Governor. So how does this end? Cement booties for all? Some days I walk myself to the statehouse in the dark, sit attentive through long committees, ask unwelcome questions, end up the sole no or yes vote on a bill, look at the long list of evening events we are supposed to attend and wonder what I am doing. I forget how many kind people have written to tell me how much better it makes them feel that I am here. I forget that on occasion I do make a change that affects lives, I give voice to what isn't heard or those who will be harmed. And that is something. Today when we heard a simple bill to mandate that insurance companies cover "elemental formula" as if it were medicine so that kids (whose lives depend on eating this formula instead of food) can afford it and can stay alive. So that you know, some kids can't eat regular food. At about two months their bodies reject their mother's milk and if they are lucky their doctor figures it out and puts them on special formula and then about 1/3 of them get better quickly, another bunch get better in a year or two and a very few need the formula for life. But Idaho insurance companies don't cover this stuff. And after today's vote they still won't. The companies promise though to try harder and we believed them. We don't like mandates I guess. This is something new for me to know about the Commerce Committee. It governs health insurance. Or, I know now, doesn't govern health insurance. All the things we COULD do to make health insurance companies do a better job, stop denying claims, be more accountable for making people wade through so much red tape to get something covered they know should be covered... we don't do that. We trust insurance companies instead. I sat there today and listened to those parents' stories. I can only ask what kind of nation makes people lose everything because someone in their family is sick? What kind of government tells them to get a divorce so they can maybe qualify for Medicaid so their child does not die? What kind of state makes people go through this? Run up tens of thousands on their credit cards, sell everything? What kind of people refuse to do anything because the insurance company lobbyists are really nice people and they promise us things if we will only agree not to make them do what they don't want to. I'm disgusted because we have no backbone, because I work in one of the few places where we COULD fix some of what is wrong with healthcare and we won't. I'm disgusted because I work in one of the few places in the state where the people I work with mostly don't seem to think there is anything wrong with insurance companies or the way health care works. Or worse, they use how broken the system is to agree to do nothing at all. On a similar insurance coverage issue, Lot Watts, social worker from St. Als Hospital testifies as to how some cancer patients are unable to pay for a chemotherapy drug because insurers classify it as a pharmaceutical rather than a cancer therapy. Watts and the chemotherapy bill's sponsor Senator Joyce Broadsword are opposed by not fewer than seven seated insurance industry lobbyists. Whether I am just one voice, or we are four or seven or 19 or 18, we will be there. To say what needs to be said sometimes... on the house or Senate floor, in committee or halls of the statehouse. I am asked again and again why I'd want to serve in the Idaho Legislature representing a party that makes up only 25% of that law making body. I love the issues and also know that just being there to say when something is not right or to speak for the Idahoans who don't win the floor debate or the Committee vote. That's part of why we run. We, the fewer. The minority. John McGee is a Republican law maker appointed to the Senate the same year I was first elected to the House. He is a moderate and a kind person. Speaking with him at College of Idaho last week, I felt how different are our experiences as legislators, his and mine even though in many ways we play somewhat parallel roles in our respective parties. We were chosen by our local presidential campaigns to debate together three times this election season on KBOI radio, each giving our rational as to which candidate won each of the Presidential and Vice Presidential debates. But John serves as chairman of a the Senate Transportation Committee. He's been a possible appointee for Lt. Governor and the U.S. Senate. He cuts ribbons when new sections of freeway open. This year I will be a freshman in the Senate, the second to the bottom of the order of seniority there, bringing with me four years in the House, visible and often a lead voice on the issues, but never with a formal title, never a chair vice chair. As a member of the Minority, by virtue of the process, I often speak for what does not pass, what never gets printed or even heard. Most the battles on the House and Senate floors, the ones you see on Public TV are not partisan battles. Those bills we debate on the floor and the issues attached to them have made it out of committee with the support of the Majority, or at least some portion of those on the committee who serve in the Majority. I speak alongside republican colleagues in those debates and the legislature becomes a deliberative body where the partisan minority and majority lines blur. I will debate with John McGee this year in the Senate I am sure, on issues that have nothing to do with our political parties. We will make law together, Democrats and Republicans. But listen to what issues Democrats raise. Sometimes only we will say what never got a hearing and what the Majority has decided is not going to be heard. I adapted the following based on a piece by House Democratic Assistant Minority Leader, George Sayler, I added several points as did many of the 19 members of the Democratic Caucus of the House of Representatives. 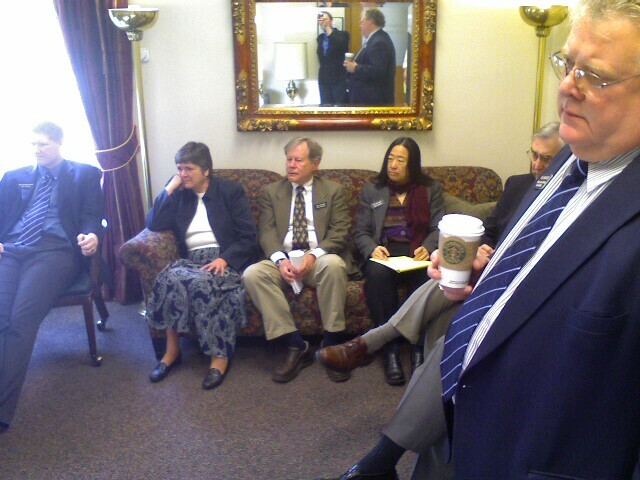 Democrats came to the Capitol ready to make progress on issues of importance to the people of Idaho. We listened to the Governor's state of the state speech, set our own budget priorities and gave our own response in which we said we agreed with many of the goals set by the Governor, not necessarily the means toward them. Sadly this session shows that Republican legislative leaders are out of touch on issues of importance to Idahoans. They ignored the advice of several statewide coalitions and working groups. They ignored "Moving Idaho Forward" which came offering public transit solutions. They stood in the way of the Farm, Ranch, and Forest Preservation working group which came ready to save Idaho lands from development. They set aside the principles developed by the legislative interim committee on tax exemptions. They chose this year to fly on a private airplane to a fund raising dinner, fly back to Boise, and the next day vote to pass a bill that is bad for working people but favorable to the owner of the airplane. This year again they catered to special interests at the expense of ordinary Idahoans, nearly shifting over $100 million dollars in big industry taxes onto the sales tax which families pay. They have opposed reforms that would clean up politics at the state level including ethics legislation that would end lobbyists' revolving door to politics. As the majority party since 1990, Republicans chair every legislative committee in both houses. This year when we challenged Republican leadership to hold hearings and discuss issues; when we called for real cooperation and consideration of sound solutions, they refused. We worked to start removal of the sales tax on food at the register; Republican leaders opposed it. We crafted legislation to limit how much health insurance companies could raise premiums on Idaho families and small businesses; Republicans refused to hear the bill. We supported conservation easements to protect Idaho's vanishing working farms and forests; Republicans killed that bill too. We supported systematically reviewing special interest tax exemptions; Republicans would not consider it. We supported affordable housing legislation; Republicans would not consider it. We proposed residential sales price disclosure to put more accountability into how we set property taxes; House Republicans would not hold a hearing. We wanted to provide Idaho's teachers with the needed level of pay increases; The Governor's plan for education penalized Idaho's teachers and included disastrous proposals like Tom Luna's iSTARS. We supported creating treatment focused alternatives to mandatory minimum sentences to make communities safer and prisons less costly and crowded; Republican committee chairs would not give this bill a hearing. We supported adequate and reasonable state employee pay increases; Republicans ignored the needs of state employees and their families and took a hatchet to retirement benefits. We supported protecting children in child care by requiring criminal background checks on child care providers; Republicans refused to hold a hearing on this bill. We supported early childhood education programs to improve quality of life and success for Idaho's kids; Republicans opposed this effort to strengthen families and improve education. We supported measures to expand children's health insurance; Republicans opposed providing 6000 children in need with essential medical care. We led bipartisan efforts for human rights, successfully introducing fair employment policies for gays and lesbians and strategies for divesting state funds from companies supporting genocide in Darfur; Key Republican leaders blocked consideration of these measures in Senate. We supported building energy efficient schools and public buildings to save money, energy and prevent climate change. We encouraged the use of global climate change studies to protect Idahoans health and our precious resources. Senate Republican Leadership killed or watered down these measures one after another. We supported open, deliberative and inclusive politics and decision making; Republicans at the end of the session proposed a 93 page bill on election consolidation and another on closing Idaho primaries without including input from voters or dialog with the county clerks. We supported local option sales taxes to allow local people to vote to fund urgent local needs including public transit and roads; Republicans derailed the process and stood in the way with a restrictive and unnecessary constitutional amendment. We proposed providing a $50,000 exemption to the personal property tax to help small business; until their special interest version of the bill nearly died, House Republican Leaders would not consider our proposal. We supported lowering property taxes by making growth pay for itself and by allowing local governments to more easily charge impact fees on new development; Republicans would not even consider the bill. The bottom line is, Democrats worked hard this session to provide solutions and make progress on issues of importance to ordinary Idahoans. We continually seek to protect the interests of our citizens, and have stood up to the special interests who seek to warp the state's democratic processes. We are committed to standing up for Idaho's middle class and small businesses, preserving Idahos quality of life and access to public lands. We support transparency and ethics in government. The Republican Majority has been an obstacle to progress on those same issues. They have pursued their own ideological goals and partnered with special interests to rob Idahoans of the kind of representation they deserve. Under current Republican leadership and with government so very unbalanced, the changes that Idahoans care about will never be accomplished. However, we will not give up. We will not stop laboring to make sure your voice is heard. Minority Leadership approaches the Speaker's desk to debate whether a motion by the Minority will be allowed. 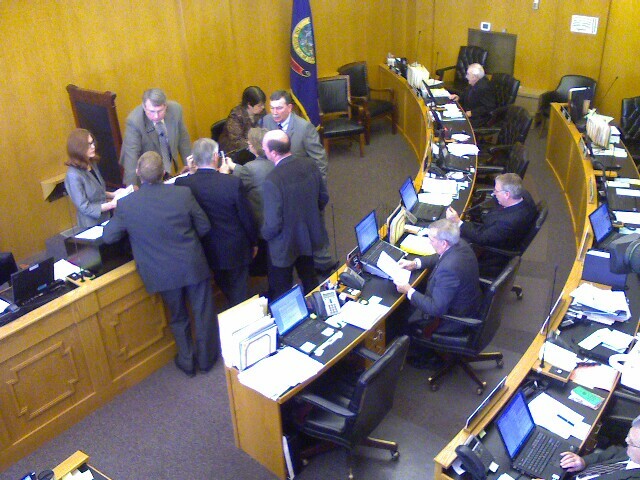 The motion was not allowed on a party line vote of 13 to 37. 20 members were missing since House State Affairs Committee was in meetings. The Speaker moved the bill to the Rev & Tax Committee where we voted 6 to 10 to not concur with the Senate amendments and instead go into a conference committee. Sadly, the conference committee gives IACI cover to kill the bill or amend it to start the elimination of the whole $120 million personal property tax. The House will vote on the move to send the bill to the joint house and senate conference committee when we re-convene at 1:15 PM. Before the door closes it is possible to visit republicans in their caucus. Here Representatives gather for what was announced on the floor as an hour and a half meeting where some have come braced for an arm twisting. This will be less than fun for moderates or small business oriented legislators who want to "concur" or agree with the Senate amendments to H599. Friday the Senate turned the big business bill into a more modest $75,000 exemption from personal property tax which will be more focused on small businesses without shifting over $100 million in taxes to families. So our caucus is done and the door on the Rev & Tax room where our colleagues meet is still closed. I think that before they went in we probably had the votes to pass the $75,000 exemption. When they come out, who knows. We debate strategy on tough issues including passing local option taxing, public transportation funding and proceeding with a small business focused $75,000 exemption for the business personal property tax. 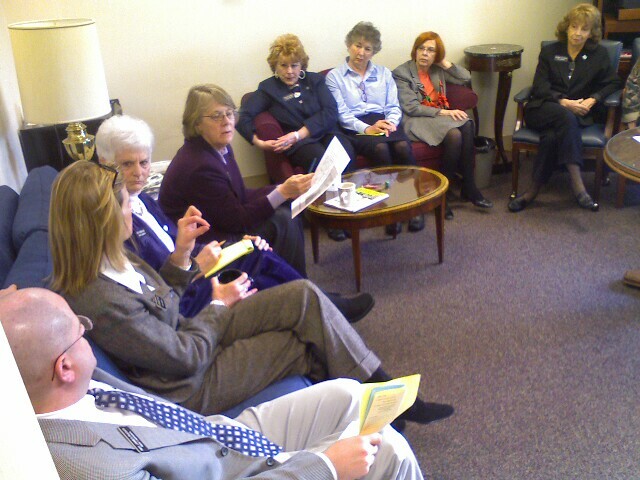 Margaret talks about substance abuse funding as the caucus takes a position against the Governor's veto. Bill Killen calculates fiscal impacts. House Democrats caucus. Our door is open and so you could walk in to the legislature and come in and join us. The Republican majority party does not hold open caucuses so I can't post a photo of their caucuses. But maybe one of my good Republican balcony colleagues will get me one next week. 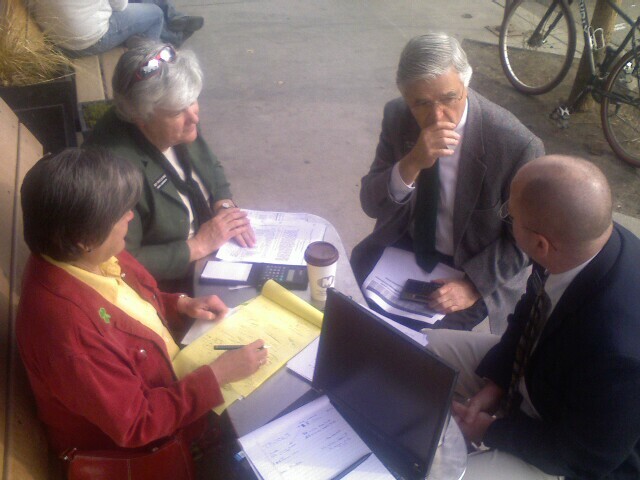 House Democrats' "Flying M Six" (Clockwise starting at left: Shirley Ringo -Moscow, Phylis King - Boise, Bill Killen - Boise, James Ruchti - Pocatello and not pictured Sue Chew and Nicole LeFavour) gather to craft a transportation funding plan. One of the hardest things in legislative policy making strategy is knowing when to be quiet. On some legislation we have a delicate balance of Democrats and Republicans who agree on an issue. In committee it is often a matter of who makes a motion. We have to think about who will be most persuasive to the opponents of the bill. Always for Democrats, because we are in the minority now, on tough bills we need to work carefully with our Republican colleagues to strategize as to which co-sponsor or supporter will make the motion to send a bill to the floor. Someone making a motion at the wrong time or when they have just made a motion to kill a key swing vote's legislation, is obviously bad strategy. Two years ago I made a motion to kill a bill in the Judiciary and Rules Committee right before I got up to present my own bill. (It was legislation to provide mental health and substance abuse counselors to High schools and Jr. Highs.) Needless to say I had to wait until the following year to pass this bill through committee and eventually through the House and Senate and into Idaho law. Hard lesson learned. I now know that there are times to sit quiet and pass a note and ask someone else to make a motion. In the House where we have 70 members, right now we need all 19 Democrats plus 17 Republicans to pass or kill a bill once it comes out of committee onto the floor. Most bills we see pass unanimously and many which are contentious do not fall on party lines. If anyone in Republican leadership is voting with the Democrats on an issue, things are easier. And this does happen. Republicans can be divided within themselves. The issue of closing their primary elections to Independents and Democrats is very much dividing Republicans here with leadership leading the charge against moderates to close them. 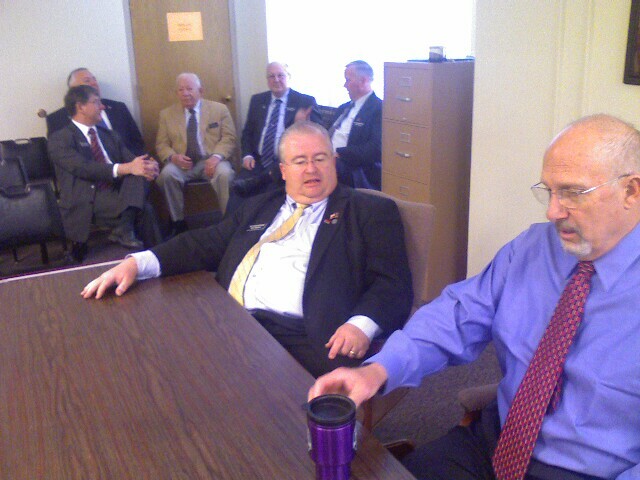 Republican leadership in the House on the Republican side is very assertive. There were days last year when a delicate alliance will fall apart just because a member of leadership stood up to assert that leadership had an opinion on the issue. I guess you might say there is a measure of fear at crossing leadership. I don't know this year how often that will be evident. It is yet to be seen. Being quiet isn't easy, especially when you want to debate against a bill because you passionately oppose it and you have something to add that's not been said. Yet if a lot of members of our caucus have already debated with no Republicans debating with us, we have can lose the bill. I had to sit quiet for a long time the other day and it killed me because I didn't want a single one of my constituents to think I did not oppose the bill. I stood up briefly at the end. The speaker called out as he does, "Good Lady from 19?" I answer as we are supposed to, "Mr. Speaker to debate against the bill...." But still I felt I did no justice to the issue. There are people like Senator Edgar Malepeai who have mastered silence. Edgar holds his words close and so, on the rare occasion when he speaks, people listen. I think of him often. He is home in Pocatello and has a substitute this session because his wife is battling cancer. I miss him. I think of him when I sit quiet. I could sit quiet more often but am often torn between the value of words and the value of silence. Silence when used correctly is powerful. So far I have spent time mastering words. Serving in a legislative body, one might have reason to contemplate power. There's the kind of power where one has a title and fills the role of figurative and proceedural leader. Usually there is a power structure associated with this authority and it can be, if it chooses, relatively absolute. There is in here the power to coerce from a titled role. By that person or group's power, committee chairships are given or taken, bills are routed or held, authority to levy campaign dollars or sway donors and endorsers is coveted and rationed. There is the power of the majority. There is the power of authority and experience which, with simple consent or agreement, with a yes vote on an issue, brings others to follow. There is the power of persuasion, a gift for knowing colleagues, knowing the body as a whole, knowing when to speak and when not to, what to point out, what to leave out and what to simply imply. This power is delicate and can be over used or over ruled. There is hopefully too the power of organizing others to a common goal, working constantly to arrange, inform, bolster and hold others in place, together. Always, with a single word, some in a body such as this, have far, far more power, coercive and perhaps, by virtue of political party or membership in the majority, they have more persuasive power than others. Even if the electorate of the state or a district rallies later against an action, the action can still be taken. There can be consequences, but those come later. This is a heirarchical structure, bound in formality. At a word, all the organizing and persuasion in the world can come crashing down and democratic -- one person, one vote -- processes evoporate into whirring fans and shuffling papers. I remember this as I work. I have to. Yes, I walk delicately, gently at times, trying to help move a universe with the fickle power of words. The first year I was elected, I ran in Hulls Gulch, up the street from my house, two mornings a week in the dark before heading to the statehouse. Time seems constricted now. The list of things to do never seems to finish before more items are added or other pages tacked on. I'm sure lots of people live like that. 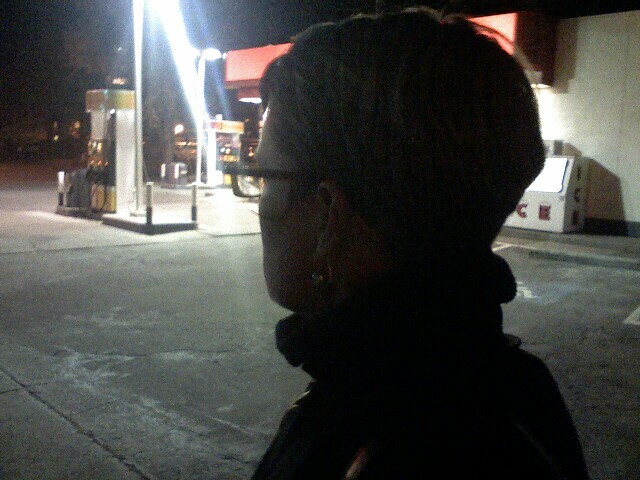 I walk to work now in the dark and it gives me time to think before the day starts. I practice debate, strategize or just listen to my heels clicking on the sidewalk. Before being a legislator I didn't even own shoes that made that noise. It is an oddly powerful sound. Woman with a purpose, big strides because these are sturdy shoes with heels, but somehow forceful and intentional. Today I felt the other kind of running, the kind which has replaced my contemplative runs in the foothills where, for fourteen years, I'd talk politics or work through problems with my friend Lee and our two dogs for a full 40 minutes before work. This running now is produced by that sense that things are moving more quickly than I can hold them down. It is a sense that triage should have taken place earlier but did not because the patients are appearing out of thin air, so now it is being attempted in flight and is just not what it could be. This running is the sense that comes from being one of 19 in a 70 member body where there are just not enough of you yet to do it all so each is doing a lot and just trying to keep above the the snow while the avalanche is barreling toward April and Sine Die. Sine Die is what we call the end of the session, the last motion made by the speaker to send us all home. For the first time this year I feel like my eyes are already running from that date to get it all done but it is ticking really loud, like those heels of mine on the North End sidewalks, click click click click. In front of an impressive bank of cameras our Minority leadership just presented our state of the state response. It is important to understand what Minority means in a legislative context. We as Democrats, because we occupy less than 50% of the seats in the house (and Senate) are a Minority. On the day when we occupy 36 of the 70 seats here we will be the Majority party. (We are at 19 now, up 6 from the 13 we were in 2005.) At 36, Democrats would nominate the Speaker of the House who manages our floor sessions and theoretically arbitrates between the parties to make us one body, one whole. We would appoint committee chairs and ourselves serve as committee chairs in every one of the House's 14 standing committees. It is an all or nothing system where those with the greatest numbers do not have proportionally greater power, they have immensely greater power. As Democrats we debate our colleagues and propose solutions. We vote as part of the body and in committee, often forming fluid alliances with moderate colleagues or those with issue concerns like ours. Can we blocked entirely if Republican leadership so chooses? Yes. And I promise this year I will watch to see whether force or discourse will prevail as a Majority party strategy for shaping policy and leading the Republican dominated legislature in its dealings with Minority opinions and legislation.Will we be allowed to persuade and ally ourselves with Treasure Valley Republican Legislators and others from around the state to fund public transportation, ensure safety and quality in day cares, eliminate the tax on food or pass more robust ethics legislation? Or will this Majority Leadership use a heavy hand and hard power to subtly or not so subtly tell members what issues they may support and what ones they may not.